Recombinant fragment, corresponding to a region within C terminal amino acids 611-777 of Human HGS (UniProt ID: O14964). H1299, HeLa, Mouse brain and Rat brain whole cell lysates; Human colon cancer tissue; A431 cells. Our Abpromise guarantee covers the use of ab155539 in the following tested applications. WB 1/1000 - 1/10000. Predicted molecular weight: 86 kDa. Involved in intracellular signal transduction mediated by cytokines and growth factors. When associated with STAM, it suppresses DNA signaling upon stimulation by IL-2 and GM-CSF. Could be a direct effector of PI3-kinase in vesicular pathway via early endosomes and may regulate trafficking to early and late endosomes by recruiting clathrin. May concentrate ubiquitinated receptors within clathrin-coated regions. Involved in down-regulation of receptor tyrosine kinase via multivesicular body (MVBs) when complexed with STAM (ESCRT-0 complex). The ESCRT-0 complex binds ubiquitin and acts as sorting machinery that recognizes ubiquitinated receptors and transfers them to further sequential lysosomal sorting/trafficking processes. May contribute to the efficient recruitment of SMADs to the activin receptor complex. Involved in receptor recycling via its association with the CART complex, a multiprotein complex required for efficient transferrin receptor recycling but not for EGFR degradation. Ubiquitous expression in adult and fetal tissues with higher expression in testis and peripheral blood leukocytes. Has a double-sided UIM that can bind 2 ubiquitin molecules, one on each side of the helix. Phosphorylated on Tyr-334. A minor site of phosphorylation on Tyr-329 is detected (By similarity). Phosphorylation occurs in response to EGF, IL-2, GM-CSF and HGF. Cytoplasm. Early endosome membrane. Endosome > multivesicular body membrane. 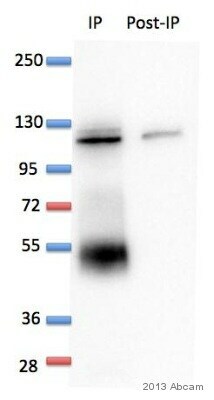 ab155539 immunoprecipitating HGS in human hTERT-RPE1 whole cell lysate. 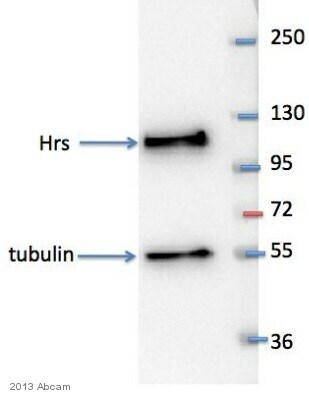 Cell lysate from 4000000 cells was incubated with primary antibody (1/500 in triton 1% buffer) for 12 hours at 4°C. Western blotting confirmed successful immunoprecipation. Lower 50kDa band corresponds to IgG. Confocal immunofluorescence analysis of methanol-fixed A431 cells, labeling HGS with ab155539 at 1/200 dilution (green) and Alpha-tubulin filaments (red). Immunohistochemical analysis of paraffin-embedded Human colon cancer tissue, labeling HGS with ab155539 at 1/500 dilution. Publishing research using ab155539? Please let us know so that we can cite the reference in this datasheet.